After an uneventful 28 hour journey (with a short stop over in Hong Kong), spent mainly sleeping and punctuated by eating some rather surprisingly good food, we arrived to 37 degrees and humidity. It was like a slap in the face with a hot damp towel. No time to acclimatize, it was a quick shower and then off to the venue. I have a showcase to do tonight on the Balcony Bar of the Austral Hotel, our performing home for the next 3 weeks. Its opening night of the Fringe Festival, this town is partying hard. It's a bit like the Notting Hill Carnival or London's West End on a Saturday night without the vomit and the stabbings. The Aussys are generally a cheerful laid buck bunch. Despite this, the comedians on the bill struggle with the very inebriated and rowdy crowd at the showcase. However, this drunken lot were my kind of crowd, they obviously enjoyed acoustic blues. For me the showcase was a lively and successful opener for the festival. I have a week of promoting in Adelaide before I start my shows proper. This involves guest appearances at a couple of ‘Best of' Shows. These are gigs, which are usually organized by a comedian or a promoter where a number of acts will appear and perform a 10-minute segment of their own shows. This provides extra income for the promoter/performer who hosts the show, an opportunity for the ticket buying public to check out a performer they don't know, and for the acts, a chance to promote their own shows. I did a couple of spots at Motley and Mccullaghs Variety show. They are very much in the tradition of the old Music Halls in the UK or the American Vaudeville Theatres. 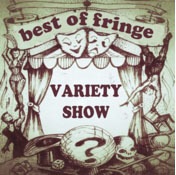 My first performance was with an interesting and eclectic line-up; an Irish magician/comedian, an Argentine football juggler, an Australian comic and a Melbourne based troupe of acrobats. Later that night a local club owner and promoter, called Brett, approached me. He has recently opened a new club in Adelaide called the Soul Box, and is looking for performers. After a look through my schedule and agreement of a fee I am now booked to play Heaven Bound at the Soul Box Club later in the run. 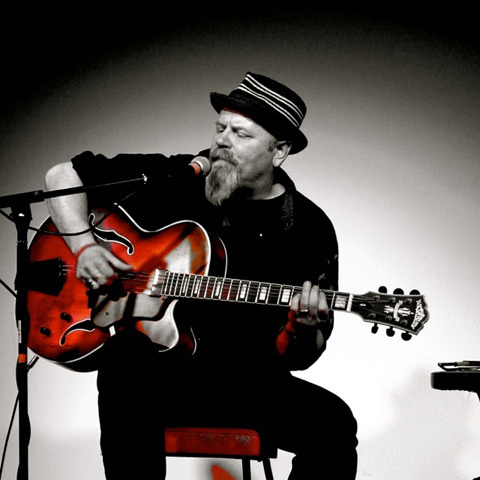 On Tuesday I pitch up at a blues jam run by an old blues man caller Roger Smith. 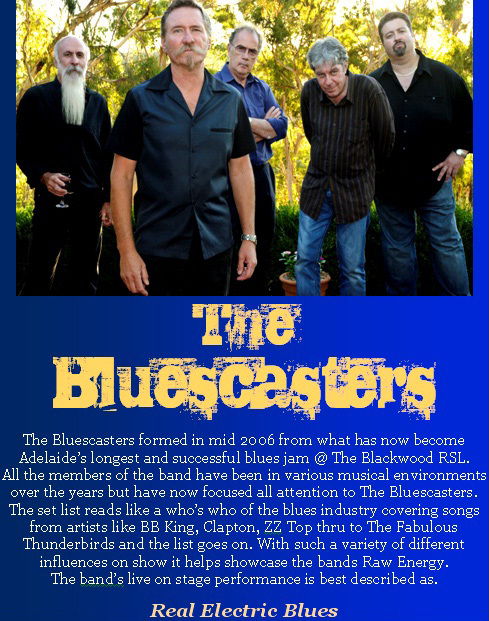 He is the Harmonica player in a local blues band called the Bluescasters. It's a very familiar set up to any UK blues fan. Hosted in a pub with a stage in the corner. 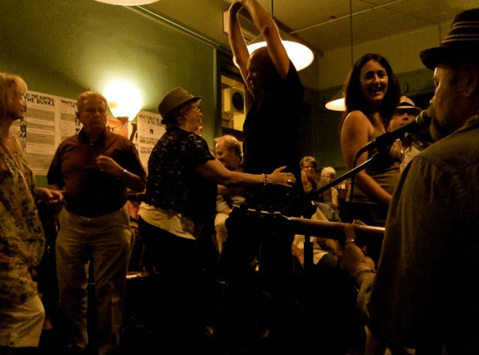 A room full of fans and musicians, all gathered to play or watch the blues and sink a few glasses. There was some amazing talent on view including several ex session / band members from various antipodean bands. Roger has very kindly given me a solo slot later in the evening to promote my show. Everyone is very friendly and supportive, much like at home when a visiting performer visits one of our jam sessions in the UK. I end up going back the following week to chill out after one of my gigs, my blues home from home. Two others of note were Peter Pix, a Sydney based muso who had flown in especially to work the festival. He plays popular standards all day and is making a mint. He flew back to continue working on a project in the studio at the end of the festival. And finally, a talented guy called Lindsey, who with the help of a sampler and loop pedal constructs complex and sometimes haunting music with the aid of a guitar synth and a drum machine, all composed in front of you. I sat on many mornings sipping coffee, waking up slowly to the sound of his wonderful music before heading off to the Festival Caravan to promote my show. 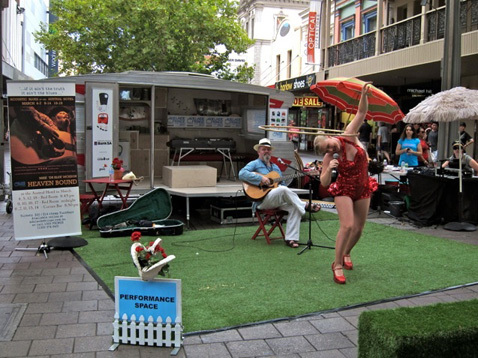 The Festival Caravan is a stage, set up in the local shopping Mall where performers book a 10 or 15-minute slot and play to the shoppers. Great fun and a really good way to promote my show. 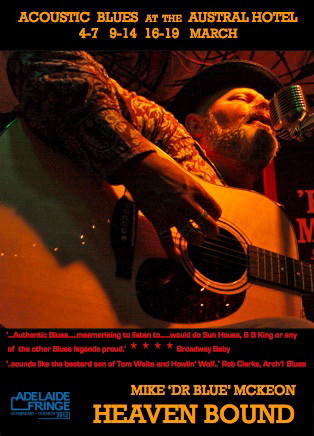 As a traveling bluesman, I am relatively new to this promoting lark. For years I have survived by putting up a few posters at a gig or played a few slots at radio stations. Promoting at festivals is a new experience, one that I started to learn at the Brighton and Edinburgh festivals last year. One wacky way of bringing my show to the notice of the Adelaidians is the ‘Tour of the Unexpected' bus. This is a free bus that drives round the city carrying punters between venues. I jumped on and engaged in, some guerilla busking, giving impromptu performances, handing out fliers and holding competitions for the unsuspecting festival goers. Much fun. Although it looks like a conventional city bus from the outside once you get on you quickly realize that it is the home for some strange and rather surreal behaviour. The driver on my first visit is wearing a rainbow wig, a rather scruffy singlet and some poorly fitting false teeth. The conductor (who also is the hoola hooping MC at the Caravan) is dressed as a rather disturbing Australian Girls Scout outfit. The bus is adorned with a range of warning signs such as ‘no pole dancing' and ‘no diving'. The journey degenerates into a zany improvised show with the rather bemused passengers singing along and dancing to a special song I wrote especially for the festival called the ‘Torrens River'. This song caused a few moments of confusion for me early in the run. The Opening lines of the song are: “I'm going down to the Torrens River I'm going to lay my body down, I'm going down to the Torrens River I'm going to lay my sweet head down”. The first couple of times I played this, the audience laughed. Instead of a friendly homage to the city (the Torrens River runs through the city), it turns out that the song has an altogether more sinister meaning. The Torrens River, it turns out, is a popular dumping spot for bodies, murdered by the local criminal community! My shows started on the Sunday of the second weekend we are here. I have three time slots in two different rooms in the same Hotel (Bar). The mid evening shows are well attended by an appreciative blues- loving audience. However the late night - midnight shows, though less well attended, start to attract many of the passionate members of the local dancing community. By the end of the run I have received a call from a dance club who, having heard from one of their members that dancers are welcome, asking if they could come and take over one of my late night shows. 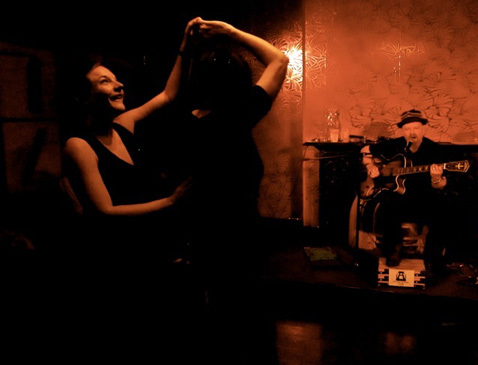 We quickly rearrange the room to create a large dance space and end up having a wonderfully atmospheric night of me playing in the spotlight on stage with a group of amazing dancers interpreting the music as I played. Just before I flew over I had taken part in a lecture talking about blues. I was reminded then of the early Juke Joints in the southern states of America where the local farm workers would gather late into the night to party, dance to the blues and forget about their worries for a while. Setting aside the racial and cultural differences not to mention geography, it was great to be keeping the blues alive in the spirit of its origins! As the run gets going we are up later and later. Post gig beers turn into late night eating and we are not seeing our bed until often after 3am. All well and good if you don't have to get up, but I have started playing at a lunchtime chat show. Although we are having lots of fun we are getting tired. I can see me finishing this run on Caffeine, Adrenalin and beer! This puts me in mind of the great Feelgoods' Milk and Alcohol! I want to come back next year, and decide to sound out a few promoters. It looks like I will be able to come out here next year and pick up gigs at venues rather than book a room at the festival and sell tickets. I have also gathered a long list of contacts, which I will be emailing when I get home. I am now planning to return next year to possibly launch my follow-up album to Heaven Bound. I have already written 4 tracks with more in the notebook I carry. The trip as been a critical success, and we have met many interesting and exciting new contacts, and we have made many new friends. We fly over to Sydney in a state of exhaustion hopeful of a few days peace and quiet before we head home to the UK. Our flight gets diverted to Melbourne when we suddenly experience a drop in cabin pressure. This means an uncomfortable 4 hours sitting around waiting for the fitters to sort out the plane. We finally get to Sydney, that evening, collapse into bed and sleep before midnight, the first night in over three weeks.